Google is by far the most used search engine available, with over 75 percent of the search engine market share. With a tight control over its ecosystem, Google has introduced many tools in order to help business owners achieve visibility on the web. One of the most overlooked tools for businesses at the local level is the Google My Business (GMB) feature. For companies who are just getting started with local search engine optimization (SEO) efforts, adding a Google My Business listing is a great place to focus early efforts. Often when people are searching for a product or service near to them, they are doing so with a specific reason in mind. Studies show that one in two people who conduct a local search intend to visit a store that day related to their search. With that being said, it is important that the information about your business is as accurate, complete, and optimized as possible. Google My Business is a free tool that allows business owners to take charge of how their business is displayed throughout all of Google’s products and platforms, including its search engine results pages (SERPs), reviews, and instant content. Google My Business complements a company’s existing website by giving their business a public identity and presence with a listing on Google. The information provided about the business can appear on Google Search, Google Maps, and on Google+. Google My Business can be likened to a social media profile for a local business and is beneficial when it comes to visibility. In terms of impact, more people are willing to click search results that show positive reviews, a frequently asked questions section, as well as timely new posts on things like events and sales. More clicks = more business. Just like traditional website SEO, Google My Business uses a variety of signals to serve search results, including important keywords and search phrases specific to your business listing. Updating your entry in Google My Business will almost always guarantee your business information is accurate in Google as well as any third-party apps or services that rely on Google to get their data. Users can consistently update their business name, address, phone number, methods of payment, operating hours, services offered, promotions, etc. By being consistent and always having up-to-date information readily available, customers are able to contact the business during operating hours and can get basic information about the business and the services/goods it provides. One of the most beneficial features of Google My Business is the ability to upload photos and videos. This allows businesses to highlight products, services, employees, or just simply display the storefront and location. Users have full control over the images that potential customers see, leading to a more powerful first impression. Google My Business offers businesses “insights” or analytical data that shows how and when customers are finding your entries. With this data, users can get a better idea of where customers are finding them. In turn, that data enables you to adjust campaigns or targeted marketing plans to improve visibility or to a specific audience. Users are able to create “posts,” or content that searchers will see when evaluating your business. These can be almost anything, such as seasonal sales or promotions that drive traffic. Some businesses post articles that provide more information on the business that may lead potential customers to their doors. These can be changed out and updated as needed – keeping content fresh and users interested. As you may already know, business reviews are a crucial component of your SEO strategy. With a Google My Business account, you’ll have the ability to turn all your Google reviews into a two-way conversation. When you log in, you can see all the reviews your customers have left and respond to them if needed. It’s the perfect opportunity to make up for a bad customer experience or thank customers for recognizing your stellar employees and services. Companies are always looking for affordable ways to market and create awareness for their business, so the word “free” is a welcome addition. With Google My Business, there is no cost to sign up or maintain your account. Google benefits from accurate information, so it’s incentivized to get as many businesses participating as possible. As detailed above, Google My Business has many tools that make it a beneficial addition to your marketing efforts. 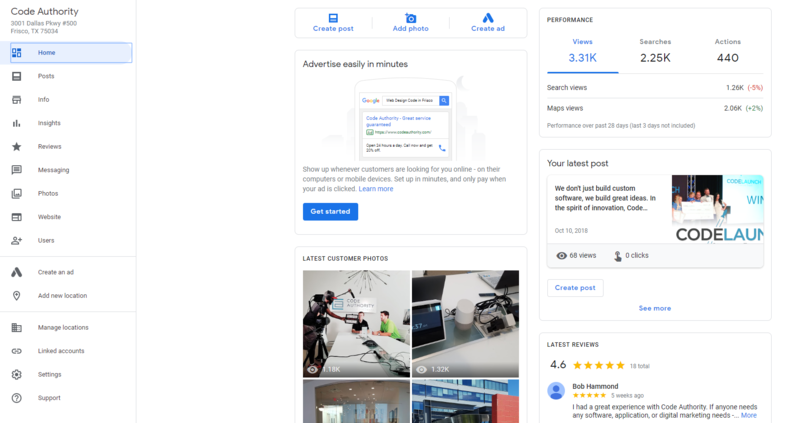 From making posts to promoting events and sales to adding photos and videos, Google My Business is dedicated to your individual business, helping it rank on search engines. Just with any new technology, it can be daunting at first. Managing a healthy, complete profile requires constant attention -- be it consistent posts or researching keywords that help prospective customers find your business faster. Google My Business gives users unique insights into their business via the creation of their business profile, which is the first step in getting started. Learn how customers find you and where they are coming from. Get a better idea of your customer community and how you can set yourself apart from the competition. See what photos are getting noticed and how what you post compares to similar businesses. The value you get from this free tool can be invaluable in how you manage your day-to-day business operations. As businesses become more digital and require frequent updates on the go, Google My Business helps out by offering a free mobile application. Users can do everything they already do on the web account, making it even easier to create a standout Business Profile anytime from anywhere. Take photos and enhance them with a range of filters. Immediately post them directly to your Business Profile. Instantly create and upload posts for new offers, updates, and events. See who is interacting with your Business Profile and continue the connection via the Customers tab, which allows the business owner to respond to reviews and message directly with customers. Other business management features include the opportunity to accept bookings online, which is convenient for customers looking for specific services like pet grooming or haircuts, as they can schedule an appointment without ever leaving the SERP. Businesses can also set up a Q&A section where customers can easily ask a question right from the business profile. As a time-saving measure, companies can even pin frequently asked questions and highlight the top answers. If digital marketing is a somewhat new endeavor for you and your business, and emerging technologies like Google My Business are not yet in your wheelhouse (but need to be! ), the Digital Marketing team at Code Authority is the partner you’ve been searching for. Our knowledgeable team works with clients to understand their marketing needs and is up to date with all the latest tools when it comes to optimizing SEO and managing business profiles, including Google My Business. Want to learn more about the services Code Authority offers? Contact us today to schedule a free consultation or get an estimate for your project.